• Mathcad shows equations as you might see them in a book or on a blackboard, expanded fully in two dimensions. Mathcad sizes fraction bars, brackets, and other symbols to display equations the same way you would write them on paper. ~ Mathcad understands which operation to perform first, In this example, Mathcad. knew to perform the division before the subtraction and displayed the equation accordingly. • As soon as you type the equal sign, Mathcad returns the result. Unless you specify otherwise, Mathcad processes each equation as you enter it. See the section “Controlling calculations” in Chapter 7 to learn how to change this. • As you type each operator (in this case, – and / ), Mathcad shows a small rectangle called a placeholder. Placeholders hold spaces open for numbers or expressions not yet typed. As soon as you type a number, it replaces the placeholder in the equation. The placeholder that appears at the end of the equation is used for unit conversions. Its use is discussed in the section “Displaying units of results” in Chapter 9. Once an equation is on the screen, you can edit it by clicking in the appropriate spot and typing new letters, digits, or operators. You can type many operators and Greek letters by clicking in the symbol palette located just below the menu bar. 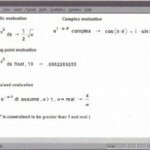 Chapter 3, “Editing Equations,” explains in detail how to edit Mathcad equations.